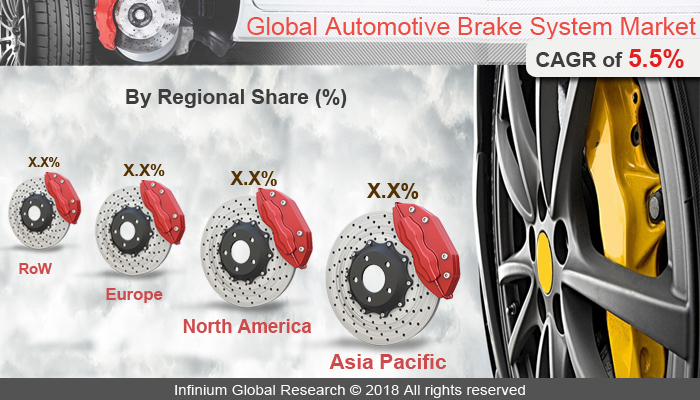 A recent report published by Infinium Global Research on automotive brake system market provides in-depth analysis of segments and sub-segments in the global as well as regional automotive brake system market. The study also highlights the impact of drivers, restraints, and macro indicators on the global and regional automotive brake system market over the short term as well as long term. The report is a comprehensive presentation of trends, forecast and dollar values of the global automotive brake system market. According to the report, the global automotive brake system market is projected to grow at a CAGR of 5.5% over the forecast period of 2018-2024. An automotive brake system is commonly employed in different automobiles. It includes the brake device comprising of different components such as brake pads, brake shoes, brake drum, rotor, piston, caliper, master cylinder, and brake booster that are employed for decelerating a vehicle. In addition, the brakes are used to reduce the speed of the vehicle and the speed of conversion determines the rate of the vehicle to slow down. Now the automobiles are fitted with two types of braking system namely foot brake and handbrake. The foot brake is used to control the speed of the vehicle when and where desired whereas; the clutch brake is applied by the lever and mostly used to keep the vehicle from moving when parked. Therefore, ABS (Anti-lock braking system) and regenerative braking have become prominent since the last decade. Ever increasing demand for automobile and vehicle production drives the growth of the automotive braking system market. In addition, increasing stringency of automotive active safety regulations and the impact of new car assessment program (NCAP) on electronics brake system is boosting the growth of the automotive braking system market. A New Car Assessment Program is a government or institutional car safety program tasked with evaluating new automobile designs for performance against various safety threats. However, the high cost of the newer technology as compared to the use of traditionally used hydraulic systems are likely to restrain the growth of the automotive brake system market. According to the World Health Organization (WHO), approximately 1.3 million deaths occur due to accidents and a majority of the deaths could be reduced with the integration of robust safety features into vehicles. Therefore, the introduction of the smart braking system has led to a decrease in the number of accidents and loss of lives. Furthermore, increasing concerns of safety and government pressures that have upturned the OEM’s towards the launching of higher technology content this, in turn, is providing several growth opportunities for the key players in the automotive brake system over the upcoming years. In addition, the introduction of the brake by wire technology that has the ability to control the brakes through the electrical system is significantly providing growth for the automotive brake system industry over the years to come. Among the geography, Asia Pacific dominated the global automotive brake system market. The region has emerged as a major automotive hub with the majority of the market share in terms of vehicle production as well as sales. Being the largest market for automobiles Asia Pacific region is estimated to witness the largest demand for automotive brakes. On the other hand, the increasing popularity of active braking system coupled with a boost in the sales of luxury and premium vehicles is driving the growth in the Asia Pacific region. China is expected to have the largest contribution in the automotive brake system market due to increased opportunity for the brake system companies. Moreover, the growth in the North American region is due to the needed implementation of the ESC (Electronic stability control) technology. The report on global automotive brake system market covers segments such as technology, brake type, vehicle type, and sales channel. On the basis of technology, the global automotive brake system market is categorized into antilock braking system (abs), electronic stability control (ESC), traction control system (TCS), and electronic brake-force distribution (EBD). On the basis of brake type, the global automotive brake system market is categorized into disc brake, and drum brake. On the basis of vehicle type, the global automotive brake system market is categorized into passenger vehicles and commercial vehicles. On the basis of the sales channel, the global automotive brake system market is categorized into OEM, and aftersales. The report provides regional analysis covering geographies such as North America, Europe, Asia-Pacific, and Rest of the World. In this section, the key trends and market size for each geography are provided over the period of 2016-2024. The countries covered in the North America region include the U.S., Canada, and Mexico; while the Asia-Pacific region includes countries such as China, Japan, India, South Korea, Malaysia, and among others. Moreover, Germany, U.K., France, Spain, and Rest of Europe are the major markets included in the European region. The U.S. drives the growth in the North America region, as it is the largest market in the region. In the Asia-pacific region, rapid industrial growth in India and China offer substantial potential for the growth in the automotive brake system market. As a result, the APAC region is projected to experience growth at a CAGR of x.x% over the forecast period 2018-2024. The report provides profiles of the companies in the global automotive brake system market such as Robert Bosch GmbH, ZF Friedrichshafen AG, Continental AG, Autoliv Inc., Aisin Seiki Co., Ltd., Mando Corp., Delphi Automotive PLC, Wabco Holdings Inc, Nissin Kogyo Co., Ltd., and Haldex AB. The report provides deep insights into the demand forecasts, market trends, and micro and macro indicators. In addition, this report provides insights into the factors that are driving and restraining the global automotive brake system market. Moreover, The IGR-Growth Matrix analysis given in the report brings an insight into the investment areas that existing or new market players can consider. The report provides insights into the market using analytical tools such as Porter's five forces analysis and DRO analysis of automotive brake system market. Moreover, the study highlights current market trends and provides forecast from 2018-2024. We also have highlighted future trends in the automotive brake system market that will affect the demand during the forecast period. Moreover, the competitive analysis given in each regional market brings an insight into the market share of the leading players. This report will help manufacturers, suppliers, and distributors of the automotive brake system market to understand the present and future trends in this market and formulate their strategies accordingly.